So I’ve planted my greenhouse and I have things growing. 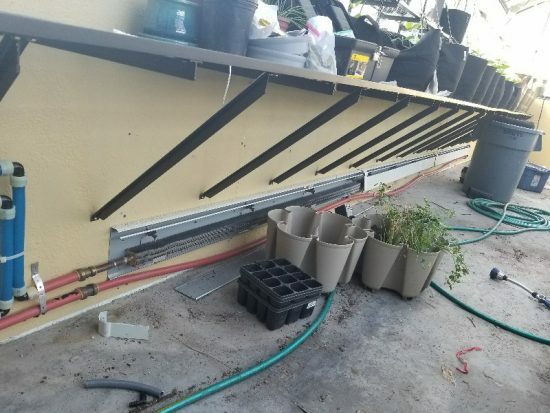 I do not yet have my automatic watering system setup yet, I have drip irrigation run to about half of it, but it isn’t automated. The humidity stays so nice and high in there though that watering needs haven’t been too bad. I planted some morning glories for color and interest, beans, beets, cabbage, kale, sweet potatoes, lettuce, spinach, purslane, sugarsnap peas, peppers, some herbs, and I also have some citrus trees growing. A blood orange, a tangerine, a lemon, and a lime. Plus an avocado tree I started from the pit. 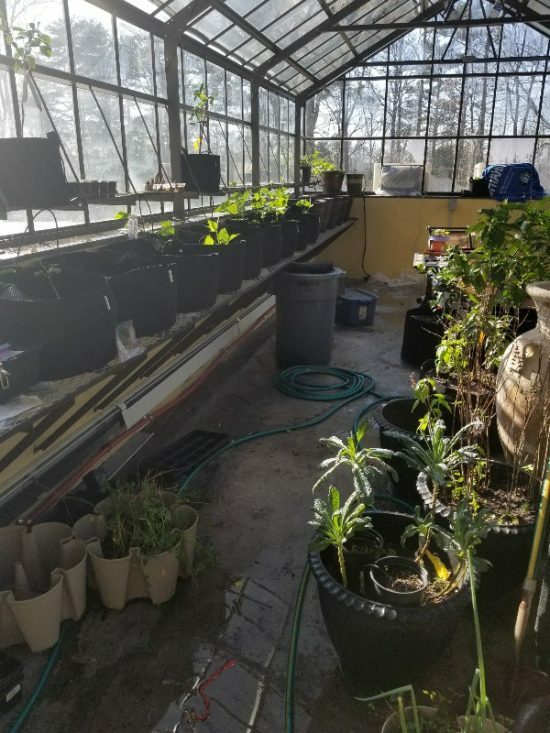 The veggies are mostly cool weather crops, but the citrus needs warmth, and I have been worried about maintaining the heat in my greenhouse at a minimum of 50 degrees lately. We had some cold weather here in Chattanooga and I’m up on a mountain. So originally I was going to do a heated floor in my greenhouse, and I guess I could have. I was going to do it all through my first floor. Radiant heat like that is supposed to be so nice and efficient, but it became a cost problem. Essentially I would have to put in two systems, one for heating, one of cooling, which increases the overall expense. I would also need to invest in a concrete subfloor for my 1st floor (which is above a basement) which is a whole lot more expensive than osb. So I kicked that plan to the curb earlier on. I thought I would put a wood stove in my greenhouse where I could just start a fire on the coldest nights. That would be doable, but I cut that as well. The chimneys and all that were adding to my cost, though in retrospect it may have still been economical. Our plan for the house changes to be a zoned split system that pumped refrigerant around to air handlers, I could have put a dedicated air handler for that in the greenhouse but each zone was quite expensive. Then I thought I would get a propane boiler (we don’t have natural gas) to do my hot water and I could do a side system off that to heat the greenhouse with a radiant baseboard, and that was the plan for awhile, but then we kicked that to the curb as well and just got a straight propane water heater (well, 2 of them). But in the meantime the refrigerant plan with the HVAC went away and now our HVAC system works similarly only it sends hot and cold water, so I could have used radiant pipes in the floor had I not already poured the slab…. So what I did was install a radiant baseboard that was connected to hvac system. It wasn’t cheap, over a grand in materials plus labor. And you know what it provided? Next to no heat, 1000 BTUs or something an hour. That is nothing. The problem is radiant heat is meant to work off a boiler, off water 180 degrees+, my hvac system uses water more like at 120 degrees or less. This wasn’t producing the heat. The baseboard helped, but was not able to keep up. Then I stumbled upon this really cheap hydronic (that is, using water) air handler on eBay (I think I searched for greenhouse heater). For like $200 I got a 100,000 btu air handler that is hung from the greenhouse superstructure. I wish I had known this thing existed before. 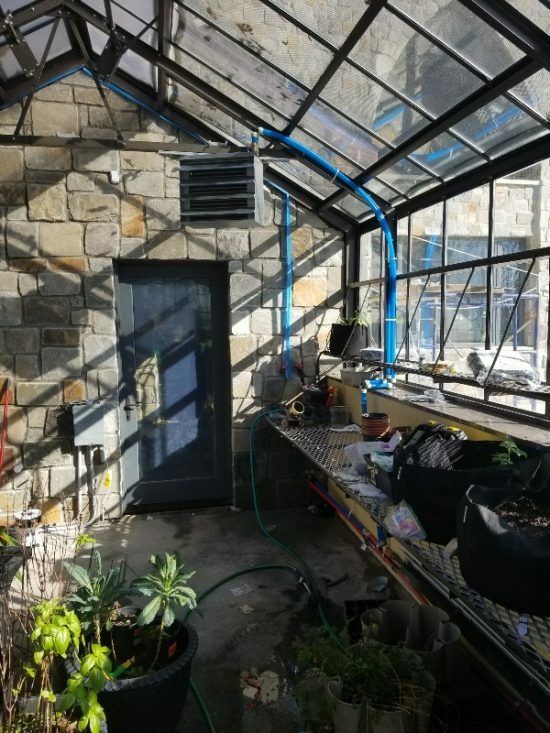 It isn’t pretty, and I don’t imagine the fan is that efficient, but it works great so far for my greenhouse. For the baseboards I already had the hot water lines run so it was just a T and 7 feet of pipe to hook up this thing. 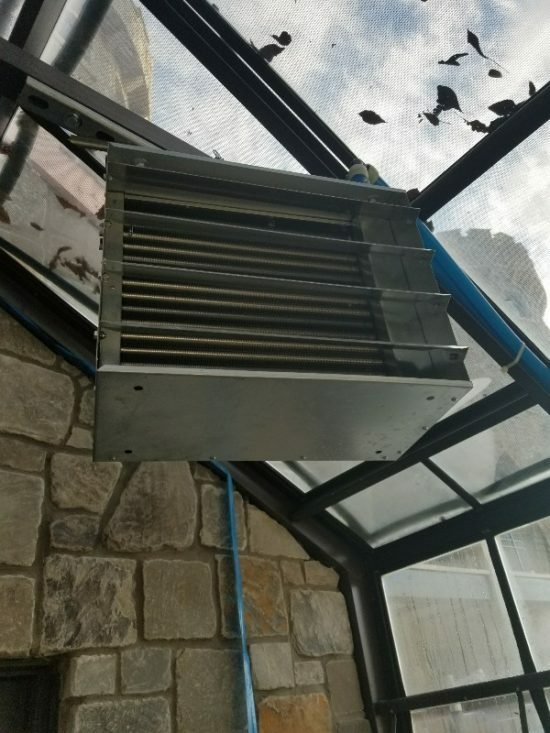 It comes on if temperatures drop to 50 or below and produces a good volume of warm air while also providing circulation. I would have saved quite a bit of money had I known about this thing in the past. Apparently it is also good for garages and warehouses. I have a pretty high end and insulated greenhouse. The foundation is insulated concrete forms, the glass is insulated low E stuff, it doesn’t need much heating, especially if it gets sunny. But on the nights after days where the sun is never seen it does need help, and this apparently will do the job. Sounds interesting. Will be waiting for info. Takes time to get things right doesn’t it? Good luck on your green house. Nice looking greenhouse. Do you ever open it up, in the summer for example? We have a big greenhouse with lots of fruit trees and some bushs below. Keep up the good work! I can, the top panes open like delorean doors.